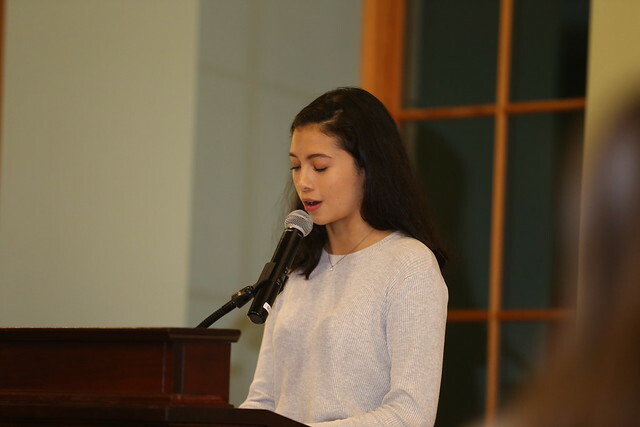 The Hun School of Princeton chapter of the National Honor Society inducted 38 new members last night in a ceremony that included Fran Held '83 as the keynote speaker. Ms. Held serves as executive director of Mitzvah Circle Foundation, a nonprofit organization based in Harleysville, Pa. that provides material support to individuals and families dealing with crisis, poverty, serious illness, and homelessness. The National Honor Society recognizes students across the country for outstanding scholarship, leadership, service, and character. To be eligible for membership, an applicant must be a full-time student in grades 10, 11, or 12 with a minimum GPA of at least 85; have demonstrated leadership both in and out of the school; show a commitment to community service; and maintain a record of distinguished character that shows integrity, respect, commitment, trust, and kindness.